ROME, Italy (CNN) -- A group of Italian investors who had withdrawn their billion-euro plan to rescue ailing national air carrier Alitalia have put the offer back on the table after one of Italy's largest trade unions agreed to the deal, the airline's special commissioner said Thursday. 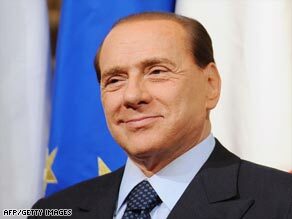 Italian Prime Minister Silvio Berlusconi has promised to rescue the airline. Alitalia special commissioner Augusto Fantozzi said the $1.4 billion deal is valid as long as Alitalia's flight operations are not suspended. Last week, the union CGIL failed to sign the deal, forcing investors, led by Compania Aerea Italiana (CAI), to withdraw their proposal. However, CGIL has now agreed to sign the restructuring plan, paving the way for the associations of pilots and flight attendants to do the same. The government has imposed an 8 p.m. Thursday deadline for the associations to accept the deal. Should they reject the deal, Alitalia faces a shutdown by Tuesday. Italian government officials said the deal is identical to the one that was rejected last week, but opens the possibility to sell between 10 and 20 percent of Alitalia to an international partner that CAI will select. There were concerns among pilots and industry analysts that without a strong international partner even a "new Alitalia" would have a hard time competing in international markets. This deal also clarifies the hiring of part-time workers and gives ground staff more days off but not a salary increase, the government officials said. The offer from CAI expires on October 15. "We need this time to transfer some of Alitalia's assets to the new company," Fantozzi said. Some 3,250 Alitalia workers are expected to lose their jobs, and will receive a severance pay from the government, according to union leaders. Among those workers are 1,000 of Alitalia's 2,150 pilots. The remaining pilots' salaries will be slashed by six to seven percent, but government officials and union leaders said the pilots will be able to recuperate some of the lost money by working longer hours. The uncertainty over Alitalia's future has cost the airline 100 million euros in failed revenues in September, Fantozzi said, and prompted Italian Prime Minister Silvio Berlusconi to cancel his trip earlier this week to the United Nations General Assembly. The potential grounding of Alitalia would be a major embarrassment for Berlusconi, who was elected earlier this year on a vow to save the national carrier by keeping it in Italian hands. Despite the crisis, flights remained on schedule. "Alitalia flies and will continue to fly," Fantozzi said.